What is Thanksgiving without a harvest table? We use 121-year-old reclaimed wood from the former Victoria Royce Presbyterian Church in the Junction. Contemporary wooden-base tables, industrial style metal bases and of course traditional all-wood harvest tables like the one pictured. Making new things from old things. 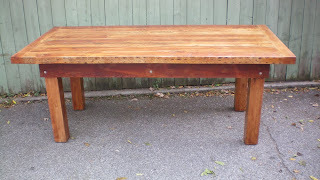 Forever Interiors is a small, independent business specializing in custom building furniturefrom reclaimed material. Forever Interiors. Simple theme. Powered by Blogger.